The 49ers have placed linebacker Shayne Skov on injured reserve with a knee injury. To take his place on the roster, defensive back Marcus Ball has been bumped up from the practice squad. Skov was injured on Sunday as the Niners lost to the Dolphins. The good news is that the linebacker did not tear his ACL and he will not require surgery. Skov suited up for 15 of the 49ers’ 16 regular-season games last year. This year, he appeared in nine of eleven possible games for SF. Playing mostly on special teams, he did not record an official statistic this year. Ball, 29, spent 12 games with the Saints in 2014, which makes up most of his NFL experience. This year, he briefly hooked on with the Panthers and appeared in one contest. He signed on with San Francisco’s practice squad one week ago and today he gets a crack at the main roster. The 1-10 Niners travel to Chicago on Sunday to face the Bears. The Panthers announced that they’ve signed safety Marcus Ball from their practice squad, adding him to their 53-man roster in advance of Week 3. Ball will fill the roster spot vacated by fellow defensive back Dean Marlowe, who was placed on injured reserve earlier this week. Ball, 29, has spent his entire career in the NFC South since migrating from the CFL to the NFL in 2014. He appeared in 12 games (two starts) with the Saints that year, posting 12 tackles and a fumble recovery, but hasn’t seen game action since. 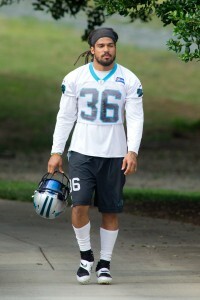 Ball spent the duration of the 2015 campaign on Carolina’s practice squad, and re-signed on a futures deal in January. During that 2014 season, Ball played on nearly half of the Saints’ special teams snaps (fourth-most on the team), and that’s likely the role he’ll play on Sunday against the Vikings, backing up starters Kurt Coleman and Tre Boston along with fellow reserve Colin Jones. The Panthers have moved their roster all the way down to 53 by making several cuts, and the NFL announced that guard Chris Scott had been suspended four games for violating the league’s PED policy. Garrett, a wide receiver out of Tulsa, went undrafted, but he believes that he is the best at his position in the 2016 class. Last year, Garrett racked up a nation-leading 1,588 receiving yards off of 96 catches.